Don’t get confused, Nikon Control was not the Nikon Camera Control Pro Software developed by Nikon, which is available for ~$150 (List price $180). Rather, it is a free tethered shooting alternative for Mac users created by Stefan Hafeneger. We have been following the development since February. We saw Nikon Control Beta 3 at the end of April. Now the software has been released as Sofortbild 1.0 with refreshing new graphics, icon, name, and some bug fixes. The features of the free application are also quite impressive considering the price you pay, which is nothing. 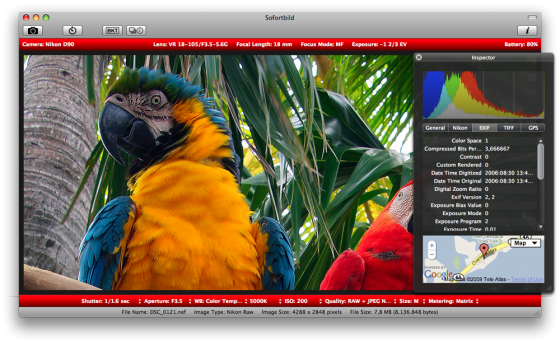 For example, the software can produce a high dynamic range (HDR) image from automatically bracketed shots. It can also display the location on a map if GPS location data is found in the image. It is unfortunate that there is no Windows version of Sofortbild but there are some other free alternatives. Most of the free camera control/tethered shooting software applications are developed based on the Nikon SDK that is available to any who agrees to Nikon’s license terms. We can certainly expect to see more alternative tethered shooting applications for Nikon while the currently existing ones get better and better. If free software can meet your needs, it is definitely nice to save the money for some other useful things. Most likely you haven’t see many alternative tethered shooting solutions specially made for Canon DSLRs. The reason – Canon EOS Utility comes with their cameras free of additional charges. Download link is available at Sofortbild Website.